In a small kitchen, every object needs to serve a deliberate purpose to earn its spot – if it’s multipurpose, that’s even better. When countertop and cabinet space is prime real estate, there’s no room for unused kitchen gadgets, too-large tools, or any other products that will create unnecessary clutter. The good news is that there are plenty of multipurpose products that can help you pare down your overflowing utensil drawer. These products are thoughtfully designed to perform multiple functions, so you can swap out three tools in favor of one single product that can do much more for much less space. And it’s not just space that these products save – less dirty dishes equals a much easier, and faster, post cooking clean up. It is for these reasons that I love the Scoop Plus from Joseph Joseph – a $10 kitchen tool that’s a colander, scooper, and much more. While the name might make it sound like some high-tech kitchen gadget, the Scoop Plus is really just a combination of a scooper and a colander. The shape is akin to that of a large serving utensil and the scoop itself is made of perforated plastic, just like a strainer. The long handle makes for easy gripping and maneuvering around the kitchen for a multitude of tasks. This tool comes in handy for just about any cooking job that requires scooping, draining, or serving, even at high temperatures. The scoop is made from a durable, toughened nylon that’s heat-resistant up to 392 degrees Fahrenheit. 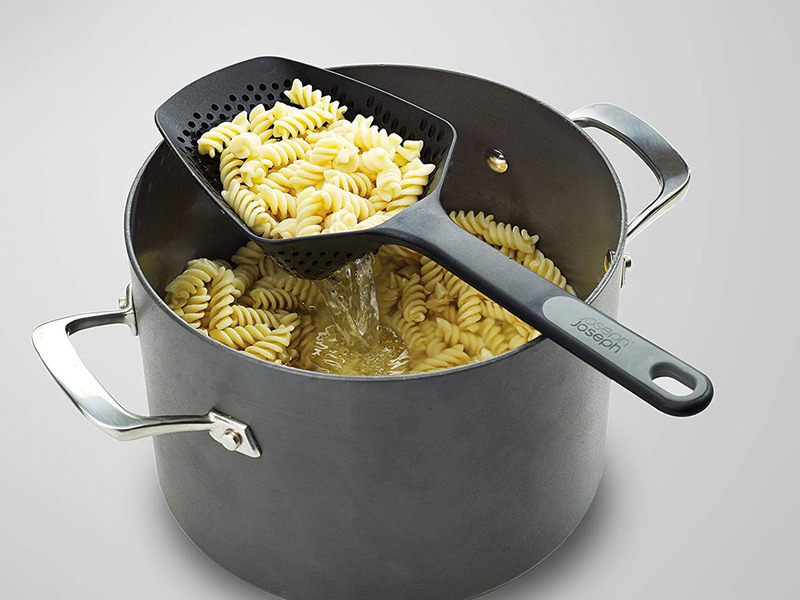 Use it to scoop freshly fried chicken from a pan of bubbling oil or pick up pasta directly from a pot of hot water, without even needing to lift the heavy pot. It works just as well to transfer roasted veggies from baking sheet to plate. I’ve even used the scoop to drain a can of beans – simply pour the contents into the scoop, rinse, and you’re ready to go. Like just about everyone else, I hate doing dishes and do whatever I can to avoid them. Sometimes, I just drain pasta straight from the pot very slowly and hope that I don’t lose any noodles to the sink so as to avoid dirtying an extra colander – but this product has helped me change my ways. Plus, it’s dishwasher safe, so I don’t even have to wash it myself. There are many worthy ways to spend $10 and this is definitely one of them. Whether your goal is to save precious counter space, pare down your kitchen essentials, or speed up the time it takes for your pasta to get from pot to plate, you’ll love this cheap and convenient kitchen tool.